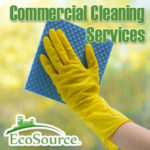 At EcoSource, we don’t just use safe chemicals and clean, new cleaning equipment – we bring the most professional and well trained staff to your facility as well. To that end, we are constantly looking at how to improve our services to improve our clients’ overall experience of convenience, savings, health and environmentally sound systems. All services are provided by professionals who have received training on chemical and equipment usage, safety at the workplace, and OSHA regulations. Emphasis is placed on minimizing the use of spray products, reducing cross contamination and removing blood borne pathogens. ATP Testing – EcoSource is the only commercial cleaning company that uses ATP testing to measure the cleanliness of your facility so you know the job is done right. Clean surfaces reduce the spread of germs in the workplace and are essential to the health of your staff and and visitors. We offer free testing at all facility surveys so you can see how well your current cleaners are performing. Facility Cleaning – Every employee, customer and person entering your office deserves a clean work space. The EcoSource facility cleaning service is the heart of our business – from the way we treat our employees, train our cleaners, the environmentally friendly products use and the care we put into thoroughness and communication with all our clients. See how we can make a difference in the quality of your cleaning.